1) Separating out the collectible coins and value these individually. 2) Many of your old coins are valued primarily by their silver content, a dynamic market with prices changing daily. Determine how much they are worth today. 3) Finding the best coin buyer for each group of coins. Step 1: Your collectible coins, those with rare dates, valuable mint marks and ones in better condition are avidly sought by dealers and collectors. 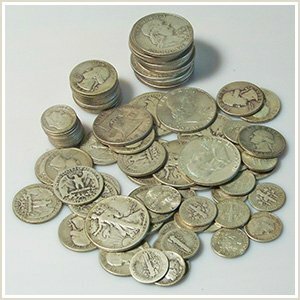 As example, the underlying value of all silver dimes as of 4/15/2019 is $1.12 and silver quarters$2.80 each. Often the value of -collectible- old silver coins is many times greater. One by one, judge your coins and determine which are of a collectible quality, these are priced individually as you sell silver coins. For date and mintmark pricing image links a the bottom of the page lead to each individual series. In general, the older your coin the more likely you find higher value. 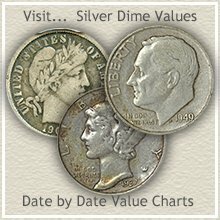 US dimes, quarters and half dollars minted before 1916 if not heavily worn, all start to carry a premium above silver value. Special Note, the Standing Liberty Quarter minted 1916-1930 is today quickly breaking away from its base silver price, with most valued higher. Next, sell silver coins carefully from the era of 1916 and until mind 1940, they contain a mixture of rare and common. Check all for date, mintmark and condition. It is among these you find some nice valuable coins. Now moving forward in years to the silver Roosevelt dime, Washington quarter and Franklin halves. Most of these are collected in "uncirculated" or brand new condition. Each series does have a small share of premium dates, well worth the effort to look for. However, the vast majority of these silver coins value is tied to the precious metal. Step 2: After you have searched through and removed all the higher value collectible coins from your group the remainder is worth the price of its silver content. 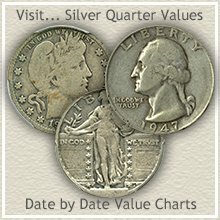 All US dimes, quarter, and half dollars minted before 1965 are 90% silver, it determines the minimum value of these coins. With the price of silver fluctuating daily, affecting the value of your silver coins, the silver value calculator shows what your coins are worth currently. Years ago and worth face value, these old silver coins are worth many times that amount today. Step 3: Now your coins are separated into two distinct groups. The non-numismatic pieces, worth silver bullion value and the higher priced collectible coins. The first group, the non-numismatic coins can be sold confidently at your local coin shop. First determine the silver coin value and expect the dealer to pay between 3% and 5% below that price. Additionally, a search of the web for silver coin buyers turns up many in the market for your coins. Each of the above options have their own advantages when selling. Values of old silver coins fall into distinct groups of low, medium, and high ranges. The article Selling Coins discusses these value ranges and points to the selling choices to get your best deal. Personally, I like to determine a wholesale value and with this information visit local coin shows. Many dealers attend making it possible to receive good strong offers. The key is research beforehand, allowing you to sell silver coins with confidence. For date and mintmark pricing the adjacent links lead to each individual series. Coin Values Discovery... 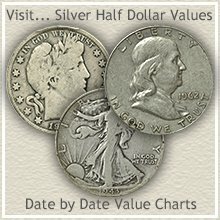 Prepare to Sell Silver Coins... All old US coin values listed. It is an excellent index with images and text links to all coin series, from Cents to Gold. Value charts, grading images and descriptions uncover how much your box of old coins is worth.